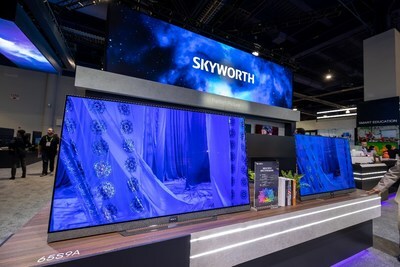 LAS VEGAS, Jan. 9, 2019 /PRNewswire/ — Skyworth, a leading Chinese producer of televisions, audio-visual products and home appliances, showcased several new and innovative technologies in the smart home sector during its participation at CES 2019, which kicked off in Las Vegas on January 8. At the Intelligent Living System Technology experience zone in the Las Vegas Convention Center’s South Hall, Skyworth demonstrated to visitors how to control a wide range of home appliances, including washing machines, refrigerators, air and water purifiers, air conditioners and climate control systems, motorized curtains and blinds, lighting fixtures and arrays, extractor hoods as well as electric fans and humidifiers, with Skyworth’s always-on AI TV in concert with their smartphones. The interplay and seamless switch between the Skyworth TV and the user’s smartphone created an exciting new experience for consumers. The company also demonstrated its user-centric personalized and customized services, including, how to instantaneously turn on, turn off and control all the lights in the home, adjust the climate control system’s air temperature to a comfortable level as well as set the timer for automated opening and closing of curtains or the turning on and off of the humidifier according to user preferences, as soon as the fingerprint of any family member is identified by the intelligent door lock. Skyworth, long well-positioned in the market as a leading manufacturer of multimedia devices, color TVs and set-top boxes, announced its intelligent home strategy in 2015. In early 2018, Skyworth and Baidu established a strategic partnership; Skyworth Coocaa’s system is fully integrated with Baidu’s DuerOS system, for the joint development of technology, content, data and operation. Skyworth continues to implement its strategy of expanding globally with sophisticated intelligent products, while also building a presence in the big data, AI, new sensor and biometrics sectors. With the support of its Intelligent System Technology Research Institute, Skyworth focuses on recruiting and developing a talented workforce and coordinating research into the technologies behind intelligent living systems, including for intelligent home and intelligent city, in addition to devoting attention to the structural, functional and system-on-a-chip technologies for intelligent vehicle systems. 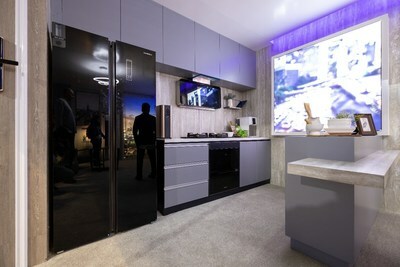 The company also established the Skyworth Intelligent System Experience Center that aims to take the lead in entering a new era defined by intelligent technologies-enabled homes, cars, communities and cities. 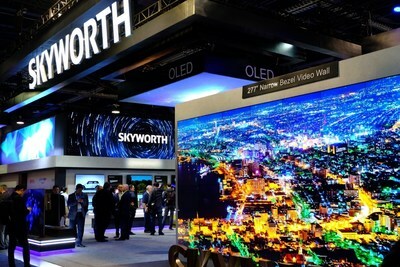 On January 7, the eve of CES 2019, Skyworth held a launch event at Caesars Palace Las Vegas. During the event, the company announced its international expansion strategy, centered around the roll out of high-end brands into global markets and the implementation of global supply chain solutions. Looking ahead, Skyworth plans to focus on developing AIoT technologies, and will open their resources for intelligent system sharing. Supported by a global supply chain, Skyworth will bring a better experience to users with better intelligent home appliances.